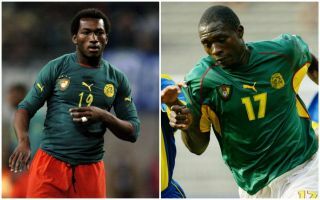 Former Manchester United midfielder Eric Djemba-Djemba has revealed the heartbreaking final words he heard from his late Cameroon team-mate Marc-Vivien Foe. The former Manchester City ace tragically died after collapsing on the pitch in the 2003 Confederations Cup, with what was later found to be a heart-related problem. Djemba-Djemba has now revealed he spoke to Foe moments beforehand, saying he’d spoken of feeling tired, with Djemba-Djemba suggesting he let the manager know to make a change in the next break in play. Sadly, it ended up being too late for the midfielder, who was stretchered off the pitch, with the news breaking after the game of his death. Djemba-Djemba, however, says now that he and his team-mates instantly knew Foe had died, in what was undoubtedly a traumatic moment for all of the team. Cameroon went on to reach the Confederations Cup final that year after being urged to play in Foe’s memory, losing 1-0 to France in the final with their heads understandably not really in the game. ‘So I said to him, when the ball goes out, we’ll tell the coach and he will substitute him. ‘But he didn’t have one minute. The ball was in the air and he jumped up with Mario Yepes, who I played with at Nantes. ‘I saw Foe fall down and then I saw Mario shouting, “Hey, hey, hey”. ‘We walked over to him and we knew he was dead straight away. ‘Marc’s wife came to the hotel, and she said to us we need to play (the final) for him, for her and her children.